Pie-making-baking and eating is good and necessary for my well-being for many reasons, and I’ve been sharing my kitchen and baking space with others, trying to spread the Pie Word. The whole process of making a pie is very theraputic. Whenever I need to ground and comfort myself in my humble home from the wild and crazy outside world, I go to the kitchen and pull out the rolling pin and ingredients, tie on one of my Grandma Crider, or, my other Grandma, Bessie McFadden’s hand-made aprons and begin creating. PLUS, there is something powerful about intentionally making a round food item, that you then slice into, put in front of someone’s face, and share…..Yes, a piece of pie is a magical thing. The only other wonderful, round food item, that comes quickly to my mind (besides pancakes) that is served in a honorable, ceremonial way is a birthday cake—-and that only happens for us once a year. How minimal! Pie can be made and served anytime, no questions asked, any season of the year. 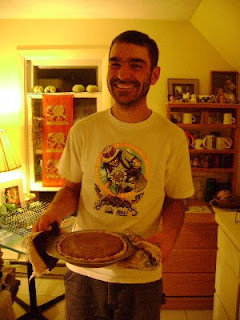 This is just a rough estimate, but I believe that I’ve baked more than 97 pies between the end of May and October 2008. That’s an average of 16 pies a month. I admit, this has been a big pie year for me. Pie is multi-functional: breakfast (quiche), lunch (pot-pies), dinner (have you ever had Onion Pie?) and of course dessert (Apple pies are my favorite, but I had fun this summer with many different types of Berry pies). 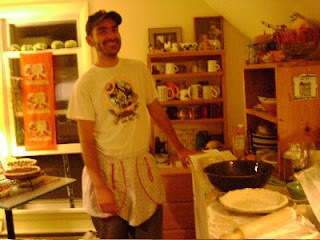 We just had our second Pie Social in TC, at the Harvest Festival at the Community Gardens, and the night before my friend Dan and I put on the aprons, whipped up some pies (seven in all) while Kristyn cheered us on listening to a music video from New Orleans. I came up with a new concotion, which I will share later on, when I try the recipe for a second time—and we named it a “Chumpkin Pie”—-made with 75% dark chocolate, with a nut/seed/cocoa nib topping. We’ll post our recipes for Dan’s Pumpkin and my Chumpkin pies later, so check back! Because I have a long and memorable relationship with the making and baking and eating of pie. Here’s part of my story…. My first pie was made when I was about 13 years old, for the Clinton County 4-H Fair. I was a scrawny little kid that liked to draw and make things, and in the summer I enrolled in Baking with Mrs. Baker (no kidding) as my leader in our Victor Twp. 4-H Club. I wanted my fair entry to be special, artistic and get a blue ribbon, and so, I decided to make a Pecan Pie. It was my grandmother’s recipe, that I intended to improve upon. Bless her heart for inspiring me to become a baker, but my Grandma Lois Laverne Crider was lousy at what she taught. My mother would cringe when Grandma showed up at our house with pies or cookies or candy or cakes….Her main problem was adding TOO much sugar. Even as a sugar-loving kid I’d have to agree. Most of Grandma Crider’s baked goods made me cringe too, BUT…….what my Grandma did teach me was to bring a fearlessness and fierceness into the kitchen when I began my baking work. Even though her baked goods sucked, she had an attitude that was impressive. 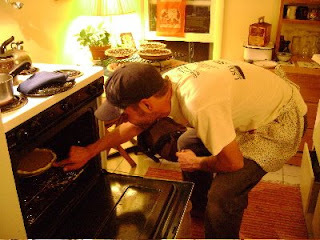 The way she taught me how to make pie crust, was to just stick your hand in the flour pot and grab out two or three handfuls of flour and throw it into the mixing bowl. She wasn’t just tossing it, or dropping it in the bowl—she was slamming it down into the bowl with a strong “YEAH, that’s right” once it hit the spot. The first time I saw her do this, my jaw dropped and I grabbed the edge of the counter to steady myself. Not in a million years would my mom put her hands in the flour pot. 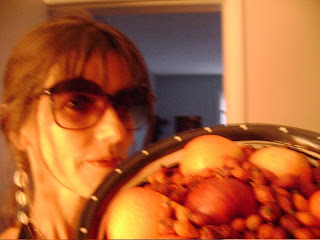 So here I am, thank you very much Grandma Crider, finding my powerful self and courage everytime I bake a pie! 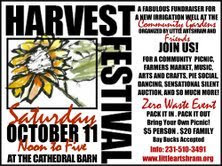 HARVEST FESTIVAL Saturday, October 11 Noon to 5pm At the Historic Barns A fabulous fundraiser for a new irrigation well at the Community Gardens! Join us for a community picnic, farmers market, music, dancing, arts and creative crafts, pie social, Moomers ice cream, sensational silent auction, and so much more! Zero Waste Event ~ Pack it in, pack it out. Bring your own picnic! $5 person, $20 family Bay Bucks accepted. See attached flyer for more info & directions. Want to help? Great! ! ~Click here to see a list of volunteer needs. You can sign up online! Volunteers get into the festival free! ~Want to donate goods & services to the silent auction? This can be artwork, crafts, toys, baked goods, gift baskets, gift certificates for your services…anything you can think of. The more varied the better! See the attached sponsor packet. OR simply respond to this email ([email protected]) to donate your time, money, goods or services. Any help is greatly appreciated!!! Thanks! We’ll see you there!! !